New Study Verifies Steel Roofs Can Last As Long As The Buildings They Cover: Typically 60 Years Or More. The cost of replacing a roof can be one of the most significant maintenance expenses in the life of a building. USGBC’s Leadership in Energy and Environmental Design building rating program (version 4) assumes a building service life of 60 years. With most types of roofing, building owners can expect to replace the roof once or twice in that amount of time, incurring significant expense to do so. 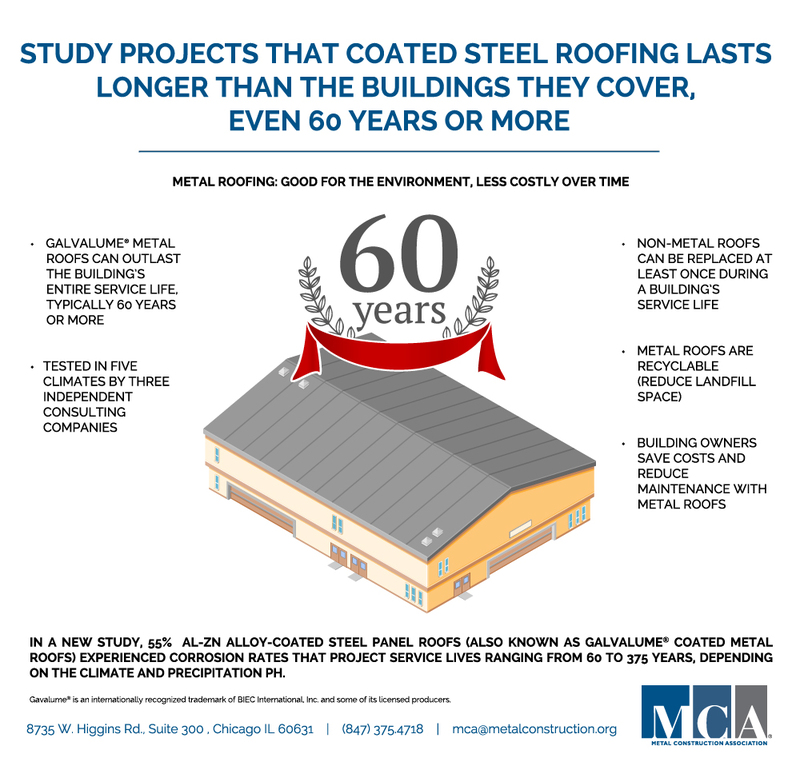 Many buildings are The Metal Construction Association (MCA) is proud to announce a new study that verifies that coated steel roofs can last as long as the buildings they cover. The research study concluded that the expected service life of an unpainted 55% Al-Zn coated steel standing seam roof constructed today in a wide range of environments using best practices can be expected to be in excess of 60 years. Learn more about the study here, and access the full study and executive report in MCA’s Technical Resources library. 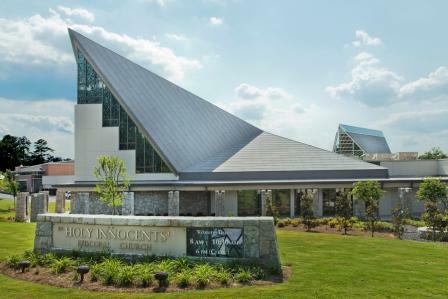 While in Atlanta attending METALCON on Oct 1–3, you may want to check out the recently renovated and expanded Holy Innocents’ Episcopal Church. 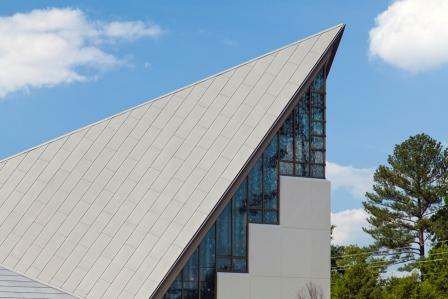 The sanctuary’s new roof features flat lock zinc panels by Umicore Building Products USA., Inc., to help bridge the existing building’s mid-century architecture and its modern chapel features. • is recyclable at the end of its useful life. While there, be sure to note the complex roof slopes and valleys, and gutters at the prow of the roof. (Zinc gutters formed by using masked stainless steel clips conceal the gutter system.) Other notable features include the sanctuary’s exposed steel structure, structural red oak wood in the decking and ceiling, an aluminum veneer curtain wall system, and a continuous ribbon vaulted skylight. Once inspired, it’s time to head back to the show to network with colleagues and learn more about the latest in metal. See you there! 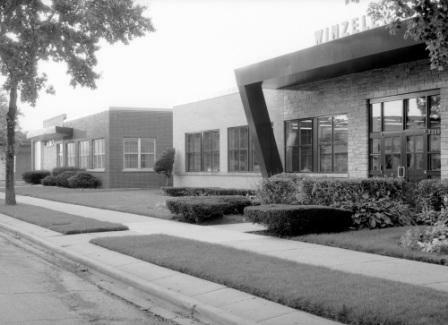 With the help of zinc wall panels, you’d never guess that this retail building, located in Hyde Park on the south side of Chicago, was formerly a Borders bookstore. 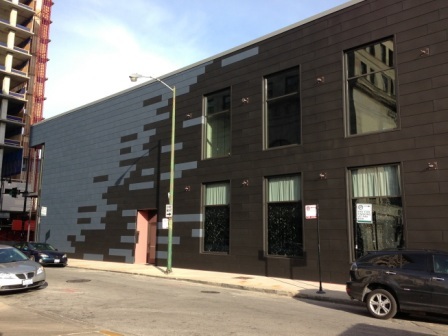 The black and patina-blue VMZinc flat lock panels are not only versatile and extremely durable, but they add visual interest, even an edginess, to the building design, say Jim Tuschall of Tuschall Engineering Company Inc., Burr Ridge, IL, and architect Wil Bruchmann of Antunovich Associates, Chicago. 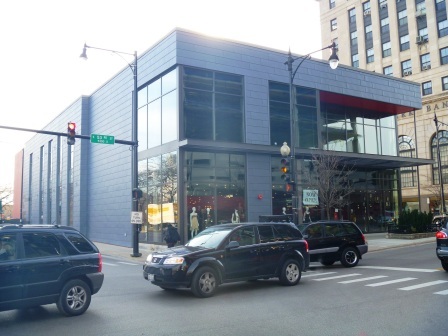 The project serves as an anchor to a revitalized retail street corridor near the University of Chicago campus. Slated to open in June, the building houses a women’s clothing store and yoga studio in the front portion colored blue, and a high-end restaurant and music venue in the black- colored back. This month Grand Central Terminal in New York City is celebrating its 100th birthday. 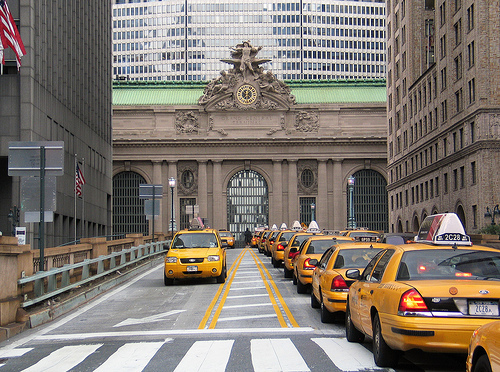 The iconic landmark has been a transportation hub for generations of travelers and commuters, and a destination for tourists and visitors looking to get a flavor for the Big Apple’s history. I had the good fortune of working several blocks of Grand Central for several years prior to joining the Metal Construction Association, and often visited it to grab a bite for lunch, meet a friend who was coming to town, or just to enjoy the beauty of the main concourse. While the main concourse is stunning, and on each visit I would notice for the first time architectural details that I had never noticed before, I always found Grand Central’s copper roof to be striking. With its green-patina and ornate details, it seemed to be the perfect crown for one of the city’s most impressive landmarks. But after spending time with MCA, I now have a greater appreciation for what that roof represents. It’s not just a beautiful architectural detail, but it’s also a high-performance feature that helped the building stand the test of time. 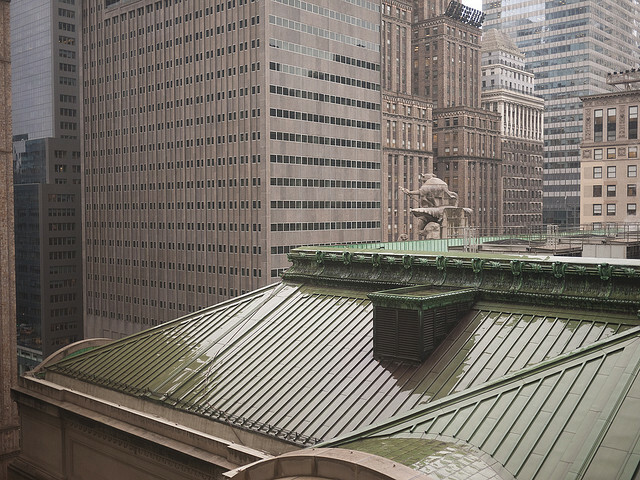 The original roof, installed in 1913, was recently replaced with a new copper roof as part of a recent renovation, even though engineers determined that it was still serviceable almost 100 years later. That’s something that the average person might take for granted, or not fully appreciate. 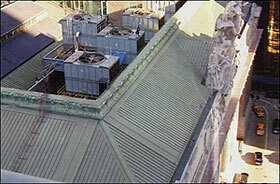 But not only did the copper roof look great, it performed well for nearly a century. That’s 100 years. In New York City. That is quite an accomplishment, and speaks to the performance and beauty of metal roofs. By Mark James, RetroSpec, LLC. If anyone understands long-term life cycles, it’s a cemetery owner. I know one in St. Louis, MO, who owns two large, old mausoleums that stand side by side. One mausoleum has steel and copper roof systems that have remained relatively maintenance- and repair-free—and beautiful—for as long as 80 years. The other mausoleum has a flat-roof addition, built in 1986, which has a conventional roofing system that has been plagued by leaks for decades. After determining the life-cycle costing and return on investment on the two roofs, it’s not surprising that the owner decided to retrofit the flat-roof addition with a metal roof. He anticipates far fewer worries with a metal roof, given its ability to shed rainwater and its 40- to 60-year service life. In addition to its longevity and durability, metal retrofit also offers long-term cost-savings in the form of appreciable value of the building, better insurance rates, and energy-efficiency. Adding insulation to a metal retrofit can provide R30 thermal resistance—one reason why you increasingly see them on military and municipal buildings, including schools. Many building owners choose to add renewable solar energy technologies to these roofs, such as photovoltaics or solar hot-water systems, which can reap huge tax benefits. For designers and architects, metal retrofits add generous curb appeal to buildings. Architectural metal roofs are meant to be seen, and a stunning sloped metal retrofit is seen far and wide—and well into the future. Mark James is president of RetroSpec, LLC, Dallas, TX. He can be reached at mark@retrospecllc.com. • Can virtually eliminate the need to use future raw materials to produce roofing. • Is unaffected by hot-cold or wet-dry weather cycles that break down other materials. • Has recycled content ranging from 25% to 95%. • Is fully recyclable if it is removed, perhaps as part of a building renovation. • Is low weight compared to other roofing materials, which helps extend the life of buildings, among other benefits. • Does not pose a health risk. • Is increasingly regarded for its energy efficiency. Read more about metal roof systems’ sustainability, recycled content, recyclability, low weight, product safety, and energy efficiency in the technical brief. 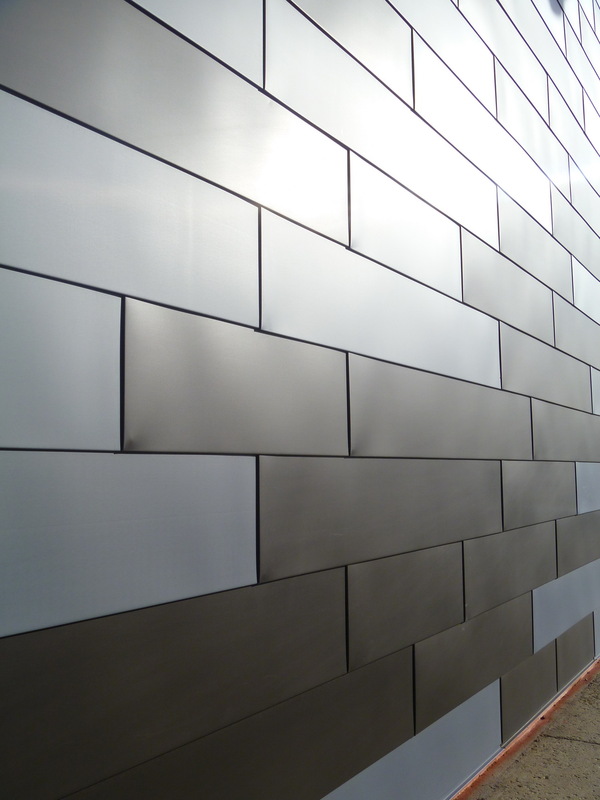 More often than not, architects and designers choose Insulated Metal Panels (IMPs) for a combination of reasons, not the least of which is aesthetics given that they come in a variety of styles, sizes, colors, finishes, and textures and can be installed both horizontally and vertically. 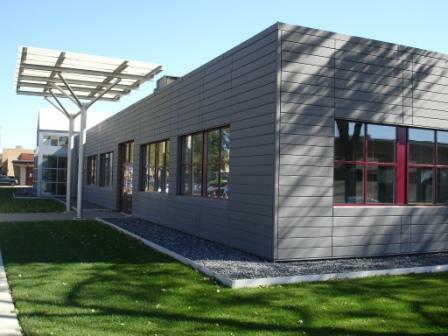 Metl-Span’s Tuff Wall® IMPs, for example, provide a stucco-like appearance to the new corporate-headquarter addition to the Hitchiner Manufacturing facility, Milford, NH, a casting supplier to manufacturers in the aerospace gas turbine engine industry. But according to Dennis Mires, PA, of The Architects in Manchester, NH, IMPs also met insurance requirements, stayed within the owner’s budget, and provided a high-tech look for the company. are energy-efficient. IMPs have two metal skins, an interior and an exterior, which are bonded to a foam polyisocyanurate insulation core, making them highly energy efficient, said Brian Jaks of Green Span Profiles, Waller, TX, a manufacturer of IMPs. Initially used on cold-storage facilities, the panels have R values as high as 8 per inch, compared to 3.7–4.3 per inch for batt insulation, and range in thickness from 2–6 inches. have thermal performance. According to Ken Buchinger of Metal Building Components, Inc., who recently spoke at METALCON, IMPs provide continuous insulation and consistent R values across walls, and have concealed fastener systems that prevent thermal bridging between the exterior and interior skins. He further noted that IMPs tend to hold their R value over time and do not have significant thermal drift. allow for fast installation. IMPs’ one-piece construction makes for faster installation, Buchinger said. Faster installation helps lower construction costs and interim financing costs. Moreover, he said, the steel skins are resistant to abuse and, compared to conventional building envelope materials, are not as affected by adverse weather conditions such as high winds. are suitable for green building. IMPs were used on the new LEED-gold-certified “Bartholomew Building” addition to William Allen High School in Allentown, PA, for their simplicity of design. “The [system] just goes together,” said Mitch Miller, associate and director of specifications of USA Architects, Easton, PA. “You’re installing the insulation and the finished panel at the same time.” Furthermore, the metal in a panel’s skin often has a high content of recycled steel or aluminum, and, when IMPs are removed from a wall, they can be recycled or re-used on another project, saving them from the landfill. offer unsurpassed design flexibility. “People like the panel because it has a flat appearance,” Jaks said. “It doesn’t necessarily have corrugation and architects like that.” He added that IMPs are available in a variety of textures, including smooth, embossed, and heavy embossed. They also come in wide range of colors, and can be customized to match any color palette. IMPs’ design flexibility allows the ability to achieve almost any look and increase curb appeal. are well suited for roof applications. More than 130,000 sq. ft. of IMPs was used to reroof the eight-building Haughton Middle School complex in Haughton, LA. According to Lauren Marchive, project architect with Newman Marchive Carlisle, Inc., Shreveport, LA, the local school board chose IMPs for their thermal performance and because the roof system was available in red, which matched the school’s original design. Even more vital was the speed and ease of installation, and that the roof could be installed during the school year on sections of buildings that were not in use. are code complaint. In his AIA presentation, Insulated Metal Panels (IMPs): High Performance Green Building Products, Randy Wilken of Metal Building Components, Inc., noted that IMPs qualify as continuous insulation, where required by the International Energy Conservation Code and ASHRAE 90.1. They are also available in ASHRAE/California-compliant cool-roof colors, as listed on the Cool Roof Rating Council’s website (www.coolroofs.org). Choosing between metal construction materials and systems can be complex—each project has a number of factors that need to be considered. But IMPs offer a host of benefits to make them an attractive choice for a wide variety of projects. Gone are the days of contractors having to justify the expense of metal roofing to customers, said Rob Haddock, founder of S-5!®, at METALCON in Rosemont, IL. Today, metal roofing is increasingly regarded as the premiere cost-saving, solar-mounting platform because, unlike other roofing systems, metal roofing can outlive PV systems by some 20-30 years, he said. Haddock noted that the service life of Galvalume steel roofs is at least 50-60 years, far exceeding the service life of crystalline PV modules by some 20-30 years. “Roof replacement is not necessary,” he said. “The roof outlives the PV system.” He noted several benefits of metal roofing, including that it’s a highly recycled construction material, is relatively maintenance-free, and that PV systems can be mounted with zero roof penetration by using seam clamps. Haddock pointed out that while traditional-generated energy is rising, the cost of solar systems has dropped by about a third in the last 5 years—from $3 per watt to about $1 per watt. Moreover, he said, “solar has a bright, sustainable future” as it gains support at the federal and state levels and among American consumers. Currently, the Metal Construction Association is supporting a study on the longevity of the Galvalume standing-seam metal roof system. Engineer Ron Dutton told METALCON attendees that Galvalume roofing systems in various climates around the country are being quantitatively analyzed. Preliminary results show that the service life of the metal roofing system far exceeds the entire assumed 60-year service life of buildings. The final results of the study are expected 2013, he said. Dutton noted several benefits of Galvalume, including that it has excellent long-term durability, life-cycle costing, and cut-edge protection. It can also be designed to various insulation requirements; has low maintenance costs; and is light weight, readily available, and competitively priced. 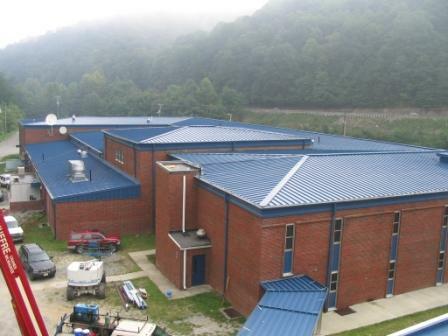 By: Todd Miller, Isaiah Industries, Inc.
Today’s metal roofs provide far more than just protection from water intrusion; they now add visual beauty, style, and personality to a building—and then some. This is particularly true with steep slope metal roofs, those with a 3:12 or greater pitch. Some of these roofs can cover as much as two-thirds of a building’s exterior, providing a broad canvas on which to make a visual statement. For property owners, choosing an attractive roof that enhances a building’s overall design is critical. There are many options of metal roofs from which to choose. 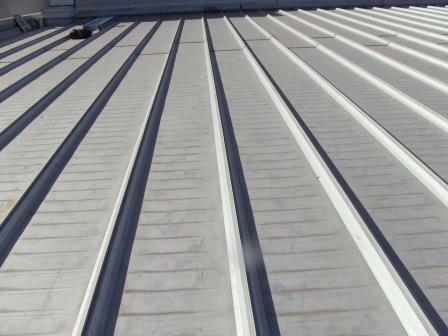 Standing seam metal roofs offer clean, straight vertical lines. Numerous through-fastened profiles provide a more fluted or corrugated look. Then, there are metal roofs specifically designed and manufactured to look like wood shakes, slate, barrel tile, and even dimensional shingles. With these options and advances in coating, we can safely bid farewell to those monochromatic, heavy-looking metal roofs of yesteryear. Low Weight. Metal roofs typically weigh from 50 to 125 lbs. per 100 sq ft. Aluminum metal roofs are typically the lightest, while steel and copper roofs, at about 125 lbs. per 100 sq ft, are about one-third the weight of standard shingles. Wind Resistance. 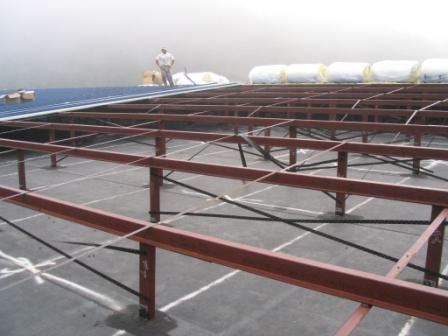 The uplift pressures exerted on steep slope metal roofs can be significant during heavy windstorms. Due to their fastening methods and often interlocking nature, metal roofs hold on tight, even in heavy winds. Think of metal roofing as a building upgrade that adds property value, beauty, comfort, efficiency, protection, and freedom from maintenance. 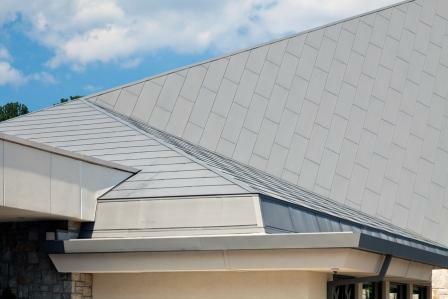 Contact MCA for more information on metal roofing. 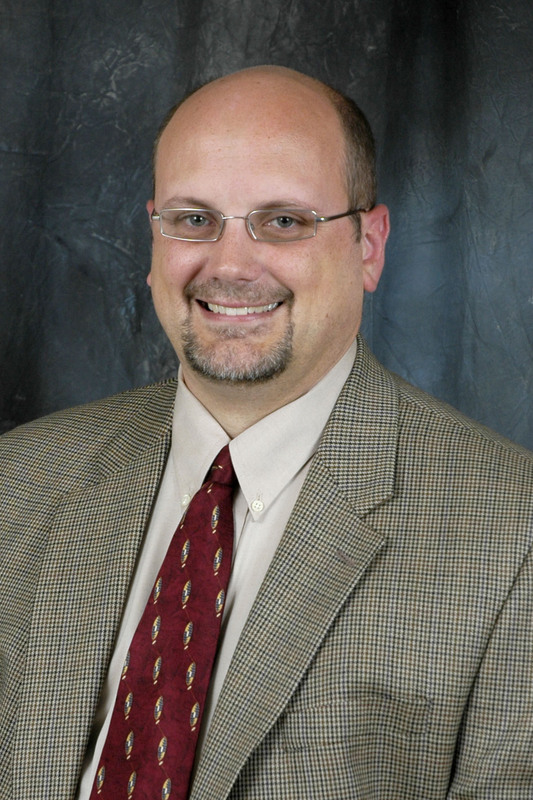 MCA Board Chairman Todd Miller is president of Isaiah Industries, Piqua, OH. No, we’re not referring to retro metal music like Kiss or Quiet Riot. We’re talking about retrofitting buildings with metal roofs and metal walls. No matter the age or style of building, retrofitting with metal can offer many benefits, including potential long-term savings, design flexibility, sustainability and energy efficiency. Building Operating Management magazine recently published a four-part feature article focusing on the many benefits of retrofitting with metal. The article offers a wealth of information and features insights from several Metal Construction Association member companies. Interested in learning more about retrofitting with metal walls and roofs? Register for the free “Retrofitting with Metal Roof and Wall Systems” webinar on November 6. Visit our Retrofit page for additional resources about retrofitting with metal. Or visit our Case Study library, and search for “Retrofit” to learn more about inspiring retrofit projects.